The AANA is also concerned about the addendum to the president’s budget which recommends cutting the National Institute of Nursing Research (NINR) by approximately $3 million, a decrease of 2 percent. CRNAs who recertified or originally certified in 2016 will complete the next step in the CPC Program beginning this April when the 2-year Check-in window opens. Where you used to recertify every two years, now you’ll instead do this quick and easy Check-in requirement at the mid-point in the 4-year CPC Program cycle. And it should only take about 10 minutes (or less) to complete. The 2-year Check-in is an important step and requirement, as completing this process continues CPC compliance for the upcoming two years. By checking in, CRNAs will confirm current licensure and practice, update contact information, pay the same fee ($110) as in the past, and check CPC compliance progress (Class A, B, Core Modules). Look for regular updates and reminders on the 2-year Check-in. 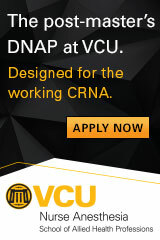 Visit nbcrna.com/2YCI today for more information. The Centers for Disease Control (CDC), the American Nurses Association, and the NICE Network invite you to register now for a free webinar with continuing education, "Empowering Nurses to Protect Themselves and Their Patients: Exploring Best Practices in Injection Safety," on Thursday, 2/22 at 1 PM EST. The webinar will feature Chuck Griffis, PhD, CRNA who will discuss the essential balance between meeting immediate or emergent patient safety needs and performing all recommended infection control practices during clinical care. Register here. US Food and Drug Administration (FDA) Commissioner Scott Gottlieb, MD, warns the public about the herbal supplement kratom in a recent statement, stating "There is no evidence to indicate that kratom is safe or effective for any medical use" and likening its chemical compounds to opioids. Learn more about the FDA’s computational analysis and deaths associated with the use of kratom in the full statement. Providing Culturally Competent Care for African Americans and reducing health disparities is an important initiative to improve outcomes for patients from diverse backgrounds. Many African Americans experience healthcare disparities that result in limited access to healthcare, the underutilization of healthcare services, quality of care received, and having inadequate health insurance coverage. When individuals have these limitations, it is important to be culturally sensitive and competent to ensure the patient receives the best quality of care. When a patient has a positive experience, he or she is more likely to engage in their own healthcare in the future. Read more about this issue and its importance for CRNAs in the AANA Press Release. Be sure to view and share "CRNAs: Helping Millions Every Day," a new video created by the Michigan Association of Nurse Anesthetists. View the video. Lieutenant Colonel Matthew Uber, CRNA, USAF, was among five Special Tactics airmen to receive a Bronze Star from the U.S. Air Force for extraordinary heroism. Lt. Col. Uber, along with Capt. Cade Reedy, Lt. Col. Ben Mitchell, Maj. Justin Manley, and Maj. Jonathan Chin received the military's fourth-highest medal during a ceremony at the University of Alabama at Birmingham on Feb. 13. The airmen were part of an elite special operations surgical team that provided quick, life-saving care during an overwhelming surge of casualties while forward-deployed with special operations forces in the fight against the Islamic State. They treated more than 750 patients, managed 19 mass-casualty events, performed 16 life-saving surgeries and cared for partner-force casualties exposed to chemical weapons during the summer of 2016, according to the team's "Portraits in Courage" story. A team from Vanderbilt University Medical Center carried out a nested case-control study centered around the theory that prescription opioid use is an independent risk factor for invasive pneumococcal disease (IPD). The hypothesis is based on the knowledge that some opioid analgesics possess immunosuppressive traits that inflate the risk for infection in animals. Using administrative and surveillance databases, the researchers identified 1,233 patients at least five years of age who were diagnosed with IPD between 1995 and 2014. A control group was populated by 24,399 patients matched according to age, county of residence, and date of diagnosis. Study participants with IPD were more likely than controls to be current opioid users, with the strongest associations formed for long-acting or highly potent opioids as well as those given at high doses. In light of the findings, the investigators conclude that opioid use correlates to higher risk for IPD and serves as a novel risk factor for the condition. From "Opioid Analgesic Use and Risk for Invasive Pneumococcal Diseases"
Annals of Internal Medicine (02/13/18) Wiese, Andrew D.; Griffin, Marie R.; Schaffner, William; et al. A study done in Tunisia compared the safety and efficacy of acupuncture, as opposed to intravenous titrated morphine, for emergency department (ED) treatment of renal colic. Researchers randomly allocated 54 study participants to 30 minutes of acupuncture therapy after a prespecified protocol. The other 61 participants were assigned to 0.1 mg/kg of morphine at five-minute intervals until pain score was cut at least in half from baseline levels. Visual analog scale ratings were assessed at baseline and at 10, 20, 30, 45, and 60 minutes after treatment onset. From the first measurement until the end of the intervention, acupuncture delivered a deeper analgesic effect than titrated morphine. Analgesia was also faster in the acupuncture patients, who needed just 14 minutes to achieve the desired 50% reduction in baseline VAS compared to 28 minutes in the morphine group. Only three acupuncture recipients experienced minor side effects, far fewer than the 42 morphine recipients. No major side effects were documented. The study results indicate that, in the ED setting, acupuncture offers faster and deeper analgesic effect and a better tolerance profile than titrated IV morphine in patients presenting with renal colic. From "Acupuncture Versus Titrated Morphine in Acute Renal Colic"
Journal of Pain Research (02/18) Vol. 11, P. 335 Beltaief, Kaouthar; Grissa, Mohamed Habib; Msolli, Mohamed Amine; et al. With so much research and discussion around the potential for poor neurodevelopmental outcomes after pediatric surgery, one group of investigators questioned how mortality and morbidity are affected by early exposure to anesthesia. Knowing that age younger than three years, exposure to multiple anesthetics, and prolonged exposure to the drugs are all risk factors for neurodevelopmental delays, the team from the Children's Hospital of Wisconsin and Medical College of Wisconsin theorized that the same predictors would apply to morbidity and mortality outcomes. Led by George Hoffman, MD, they reviewed medical records for 61,088 children treated at the hospital between 2013 and 2016. With 400 deaths, the mortality rate was estimated at 0.65 percent. The researchers analyzed outcomes based on a number of variables, including the same risk factors for neurodevelopmental delays as well as ASA physical status score, age, and more. "In summary, exposure to anesthesia and surgery identified children at significantly longer term risk of mortality at 30 days. Age, ASA physical status score and multiple/prolonged exposures all had associations with higher mortality risk in univariable analysis. After controlling for ASA physical status score, multiple exposures and cumulative exposure time had small, incremental effects on mortality," Hoffman reported. "So the risk factors for mortality were similar to those risk factors previously identified for neurodevelopmental delay." From "Risk Factors for Neurodevelopmental Delay in Children Mirror Those for Overall Mortality"
Research suggests a link between Parkinson disease (PD) and higher rates of unfavorable perioperative and postoperative outcomes, possibly due to negative interaction between anesthetic agents and PD medications. Because of its potent anesthetic properties, for instance, propofol is frequently used for PD patients who require surgery. However, the drug has been shown to trigger dyskinetic activity in individuals with and without PD or other movement disorders. Research published in 2006 indicates that dexmedetomidine might be one strategy for managing this particular complication, especially in individuals in the late stages of disease. As another example, evidence finds that halothane is not an optimal choice of anesthetic for PD patients who take levodopa, due to the heightened cardiac sensitivity it causes. Instead, clinicians are advised to consider sevoflurane, enflurane, and isoflurane. Simon JG Lewis, who co-authored a recent review in the Journal of Clinical Neuroscience, says that for PD patients in general, "special consideration will need to be given to the timing of medications pre- and post-surgery [and] the potential for neuropsychiatric problems such as psychosis and confusion." The Australian professor of neuroscience adds that prospective, multi-site studies examining short- and long-term effects of general anesthesia on motor and non-motor aspects of PD are needed. From "Anesthesia in Parkinson Disease Requires Cautious Care"
The medical literature suggests that patients treated for rotator cuff-related pain might get more short-term relief from corticosteroids than from local anesthetics. A systematic review, published in the British Journal of Sports Medicine, looked at findings from 13 relevant randomized controlled trials with more than 1,000 participants collectively. Each study compared single or repeat injections of local anesthetic against subacromial corticosteroid injections, with or without local anesthetic. Shoulder pain, function, range of motion, and patient-reported improvements were evaluated at three different intervals: three months, three to 12 months, and longer than one year. Of four studies deemed to carry low risk for bias, three pointed to greater improvement of outcomes in patients treated with corticosteroids rather than local anesthetics only. The effect was evident for only up to eight weeks, however, with no significant difference apparent between patient groups during followup over three to 12 months. The data did not allow for comparison of outcomes beyond one year. "If local anesthetics prove safe and effective in future research, significant cost savings could be achieved," the investigators concluded. From "Injections of Corticosteroids vs Local Anesthetic in Rotator Cuff-Related Shoulder Pain"
Researchers report that nearly a quarter of total knee arthroplasty (TKA) patients aged 60 and older sustained a decline in activity in one or more regions of the brain tasked with specific cognitive functions. Moreover, 15 percent of patients declined across all the brain networks studied by the team from the University of Florida. "In essence, normally synchronized parts of the brain appeared more out of sync after surgery," said co-lead author Jared Tanner, PhD. He and colleagues performed cognitive and brain imaging tests pre- and postoperatively on 48 study participants and compared them with images from age-matched controls who also had knee osteoarthritis but who did not undergo TKA. There were no changes in the "before" and "after" scans within the no-surgery group; however, 23 percent of the patients who had knee replacement presented significant declines in connectivity in at least one brain network during 48-hour followup. According to the findings, the greatest effect was observed in TKA patients who were already more cognitively fragile pre-procedure. The investigators emphasize the need for additional research. In the meantime, "we strongly believe clinicians need to consider preoperative memory and attention abilities in their patients," said senior author Catherine Price, PhD. "Across the nation, however, cognition is not routinely assessed prior to surgery." The study results can be found online in the Journal of Alzheimer's Disease. From "One in Five Older Adults Experience Brain Network Weakening Following Knee Replacement Surgery"